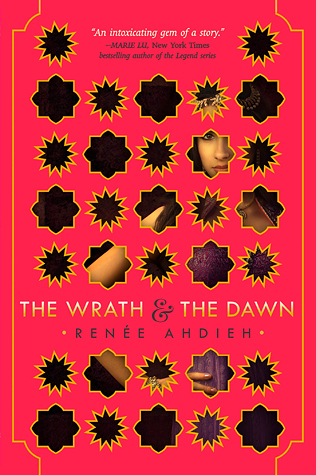 Summary: "A sumptuous and epically told love story inspired by A Thousand and One Nights. She discovers that the murderous boy-king is not all that he seems and neither are the deaths of so many girls. Shazi is determined to uncover the reason for the murders and to break the cycle once and for all." Review: Talk about a hook! That premise is killer. (Ha, pun.) I knew as soon as I read that summary that I wanted to read this book, regardless of what the reviews said. (The reviews are actually overwhelmingly positive, so I needn't have bothered to not care about them.) I'm so glad I did read this book, because it was exactly as it claimed to be: sumptuous and epic. One of my favorite aspects of this story is the setting. Khorasan is clearly very inspired by the Middle East. The architecture, the clothing, the bazaars, the weapons, the food... all of it hearkens to a very Aladdin-esque environment. We, the readers, are completely transported to this land, and I loved being there. Khalid and Shahrzad are wonderfully compelling characters as well. It's easy to see that they are both complex, troubled souls, and watching them slowly, and sometimes even unwillingly unravel to the other person was lovely. I wish the secondary characters had been more developed, but Khalid and Shahrzad's story was so consuming that this complaint is minor. You know, I'm kind of surprised I liked this book so much, considering how much of the book's focus was on the romance. That is usually a big turn-off for me, but I dug this one. Also, there is a love triangle present in this book, which is also a HUGE turn-off for me in most cases. And while I wouldn't say I liked the love triangle, it also wasn't as irritating as those tend to be in other books. I think the reason why I was okay with all the romance shenanigans in this book was because the romance itself also laced with danger, political intrigue, tantalizing secrets, and a whole lot of suspense as every dawn approached. I also appreciated that Shahrzad was not a limp noodle in regards to her feelings. She was a very emotionally aware character. She worked through her feelings and made conscious decisions, and then stuck to those decisions. I admire a girl with that kind of deliberation. The weakest part of the story was the magic system. There was almost no explanation to any of it. I'm still not really sure how it works, or who can perform such acts, or why. That was frustrating, since it plays a big role in the book's climax. I have a feeling that there will be a lot more magic in the following books, and I just hope that the magic system is more fleshed out in the future. I'm curious about it, but am currently too much in the dark. On the whole, I was very impressed with this book. I loved reading it, loved spending time in Khorasan with Khalid and Shahrzad, and I cannot wait to continue the saga. Bottom Line: A sumptuous and epic love story, rife with tension and suspense and a lot of intrigue that will completely consume you. Highly recommended! You're right. I'm hearing nothing but good about this one. Can't wait to get to it. I hope you're able to read it soon, and that you enjoy it as much as I did! I hope you like it! I really enjoyed it a lot. It's pretty different from its inspiration, 1001 nights, though, so go in with an open mind and I think you'll like it just fine.